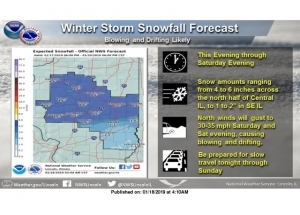 January 18 – The National Weather Service has issued a Winter Storm Warning for the entire day Saturday. The warning covers Macon, Piatt, Champaign and Vermilion counties and will be in effect from midnight Friday and until midnight Saturday. Precipitation may begin as a mix of rain, snow, and freezing rain between Interstates 72 and 70. 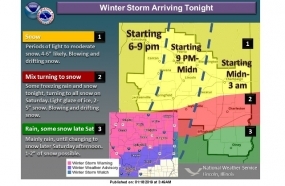 Heavy snowfall is expected with total snow accumulation between 4 and 6 inches and winds gusting as high as 35 mph, causing significant drifts possible. The wind will reduce visibility and create hazardous travel conditions with slippery roads. The latest road conditions can be found at www.gettingaroundillinois.com. Cold air and low wind chills will follow this weather system, and another storm has the potential for more accumulating snow on Tuesday.